RooCoat babywearing coats do not include a baby carrier. The Tandem Roocoat model has closable baby openings so it can be worn with 2 kids, 1 kid or no kids. Our baby carrier coat easily slips over parent, child (infant or toddler) and your favorite baby carrier to keep you and your child snugly warm in cold weather. Note: Baby carrier is required and not included. 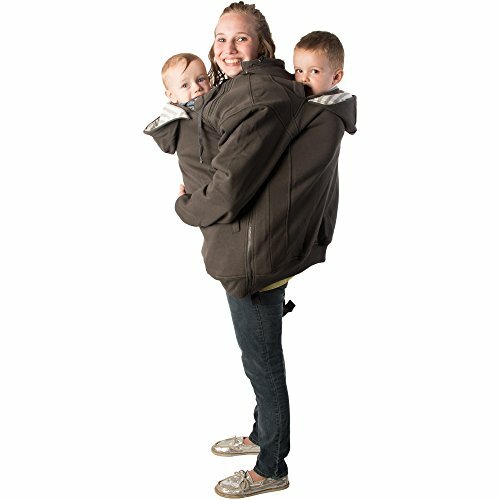 Openings on both the front and back allow you to tandem wear your kids with two carriers at once. Child hoods are removable to allow the closure of either opening. Wear with 2 kids, 1 child or none at all. Note: Coat will be baggy without wearing any babies. The exterior feels like a soft thick sweatshirt. The gray striped interior liner adds a decorative flare and extra warmth. Made with 80% cotton and 20% polyester. For plans to wear with a toddler, order normal unisex sizing. For plans to wear with an infant or for a more fitted feel, order one size lower than your unisex size. If you have any questions about this product by Roocoat, contact us by completing and submitting the form below. If you are looking for a specif part number, please include it with your message.